Since yesterday I wrote my weekly thanksgiving post with a heavy heart, I decided to replace my usual somber Tuesday’s Trial series with something a little more humorous. It is most certainly still a trial, one that I battle daily, but it’s a bit less serious than most of the trials that I have faced. I am taking a blogging class and today’s assignment was to use a writing prompt. The prompt I chose leads well into today’s post. Okay, in all honesty, a wrong answer would probably not prevent us from becoming friends. 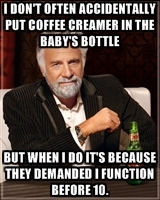 I would just have some ground rules and explaining to do… after 10 a.m. of course. 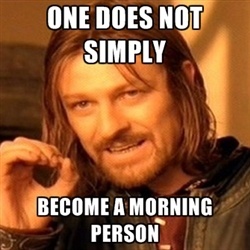 Apparently, there are “Not morning people” and “’Not a morning person’ does not even begin to explain it.” After many remarks from my co-workers through the years, I have found I fall into the second camp. I have heard my co-workers explain that they could tell the type of day I was having by whether or not they got a “Hi”, head nod or no greeting at all when I came in. Another explained that they knew it was okay to engage me in conversation once I started asking about lunch plans. 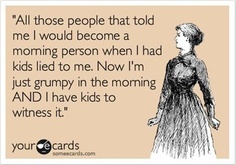 I ran into an old co-worker a couple of months ago who out of the blue asked if since having kids have I become a morning person. Nope. 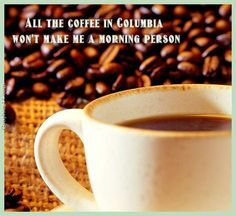 I had no idea I was not a morning person until I got married. I grew up in a family of four kids and there was an understood rule that you just did not talk in the morning. We never had to explain it to each other because that would have required us to construct a continuous thought and none of us had that capability before 10. My parents actually bought me a t-shirt with this saying! Then, I got married. I can easily remember being in the shower in the morning and my beloved new husband talking. And not just talking, but also asking questions. The only clear thought I remember going through my head was “What is wrong with him?” Almost 11 years later, I have him trained. How does this trial make it into my blog about infertility and adoption? Well, these two beautiful children I have happen to have not figured out yet that mommy does not do mornings. Somehow, I was gifted with a son who pops out of bed with a “Let’s get this party started!” attitude around 6:30 every day. I have lost all hope of converting him to my camp of no talking before 10. I still aspire to get my daughter trained. She’s a little too young to judge yet, but she is certainly quieter and calmer than our son in the mornings. Funny, no one ever said this to me. I think they knew I was beyond hope! point of trying to get up and have a cup of coffee before he wakes up (did I mention that is at 6:30?!) just to give me chance of matching his energy. I hate seeing the light in his eyes dim when he realizes mommy is not up to handling all of his chatter.